Objective An economic evaluation of therapeutic massage, exercise, and lessons in the Alexander technique for treating persistent back pain. Design Cost consequences study and cost effectiveness analysis at 12 month follow-up of a factorial randomised controlled trial. Participants 579 patients with chronic or recurrent low back pain recruited from primary care. Interventions Normal care (control), massage, and six or 24 lessons in the Alexander technique. Half of each group were randomised to a prescription for exercise from a doctor plus behavioural counselling from a nurse. Main outcome measures Costs to the NHS and to participants. Comparison of costs with Roland-Morris disability score (number of activities impaired by pain), days in pain, and quality adjusted life years (QALYs). Comparison of NHS costs with QALY gain, using incremental cost effectiveness ratios and cost effectiveness acceptability curves. Results Intervention costs ranged from £30 for exercise prescription to £596 for 24 lessons in Alexander technique plus exercise. Cost of health services ranged from £50 for 24 lessons in Alexander technique to £124 for exercise. Incremental cost effectiveness analysis of single therapies showed that exercise offered best value (£61 per point on disability score, £9 per additional pain-free day, £2847 per QALY gain). For two-stage therapy, six lessons in Alexander technique combined with exercise was the best value (additional £64 per point on disability score, £43 per additional pain-free day, £5332 per QALY gain). 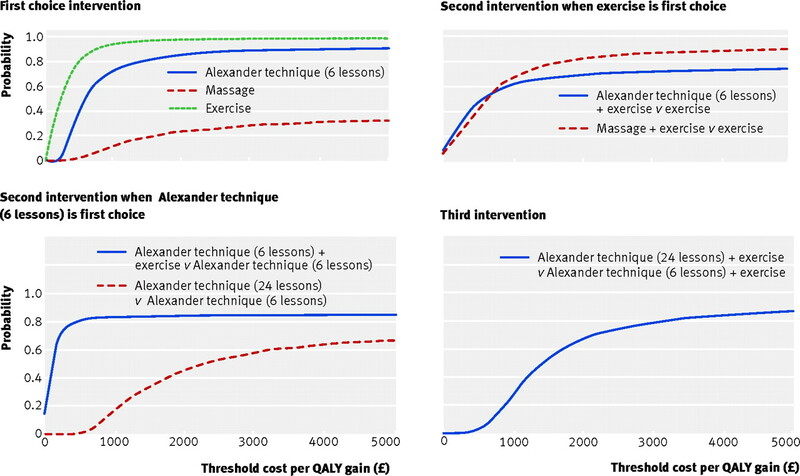 Conclusions An exercise prescription and six lessons in Alexander technique alone were both more than 85% likely to be cost effective at values above £20 000 per QALY, but the Alexander technique performed better than exercise on the full range of outcomes. A combination of six lessons in Alexander technique lessons followed by exercise was the most effective and cost effective option. In this study we compare the costs and outcomes at 12 months of courses of six and 24 lessons in the Alexander technique, six sessions of massage, and a general practitioner’s prescription for home based exercise with a nurse follow-up for patients with chronic or recurrent non-specific back pain in primary care. The main study design and interventions are described in detail in our associated paper.5 Briefly, we conducted a randomised controlled trial using a 4×2 factorial design, in which participants from 64 general practices were randomised to one of eight groups. A short course of six lessons in the Alexander technique, a longer course of 24 lessons, and six sessions of massage were compared with normal care—half with and half without a doctor’s prescription for home based general exercise and a practice nurse’s behavioural counselling. We carried out the economic evaluation 12 months after randomisation of participants, conducting it from the perspectives of the NHS, participants, and society. We included costs to the NHS, personal costs to participants, and time off work and unpaid activities. NHS costs included the intervention, primary care contacts, outpatient appointments, inpatient hospital stays, and medication. Personal costs included travel associated with back pain treatment, any private treatment and over the counter preparations, prescription charges, loss of earnings, and expenditure on domestic help and care giving. Societal costs included the value of time off work or unpaid activities and the value of informal care. We analysed the data in two ways. Individual group analysis was used to provide the most relevant information for policy makers, and we carried out marginal analysis in line with the convention for a factorial design.6 In both cases we compared each intervention group with the most appropriate comparator group as shown in table 1⇓. We estimated cost to the NHS and patients separately, and conducted a cost effectiveness analysis that compared cost to the NHS with the primary outcome of the Roland-Morris disability questionnaire,7 the number of days in pain,8 and the QALY gain estimated from the European quality of life instrument EQ-5D.9 We estimated cost effectiveness acceptability curves for the individual treatment groups to indicate the level of uncertainty around the point estimates of cost per QALY. Table 2⇓ shows the data sources and unit costs used in this study. We collected resource use data prospectively during the trial. We recorded the number of intervention sessions attended, extracted details of primary care visits and prescribed drugs for back pain from practice records, and took other information from participants’ self completed questionnaires conducted at three-monthly intervals. The EQ-5D was conducted at baseline, three months, and 12 months. We used unit costs in pounds sterling at 2005 prices. We based primary care costs on Curtis and Netten,10 secondary care costs on the Department of Health national tariff,11 and drug costs on the British National Formulary.12 The exercise prescription, which included both general practitioner and practice nurse time, was costed as primary care consultations, and the Alexander technique and massage interventions were costed at the rate paid to teachers and therapists during the trial. A charge was made for a missed appointment but not after a patient dropped out of the trial. Personal costs were self reported except for travel by car, for which we used the AA schedule of motoring costs.13 No adjustment for inflation was necessary. Data extracted from primary care records were available for all participants. Some questionnaire data, including the EQ-5D responses, were missing because of some participants dropping out or failing to answer all the questions. Complete personal cost data were available for 62% of patients, and the overall proportion of missing data points was 35%. We had complete EQ-5D data for 306 (53%) patients: the data were complete for 92% of participants at baseline, 72% at three months, and 62% at 12 months, giving a total of 25% missing data points. The level of completeness declined to 68% for the period from baseline to three months and to 55% for the time from three months to 12 months, giving an overall level of 62%. We filled in the missing data points by means of imputation by chained equation using STATA, release 9.15 This method imputes missing values using an iterative multivariable regression technique. Any number of variables can be used in the regression, and any number of complete imputations may be created. In this study we used all available EQ-5D data, plus the intervention group variable; we used 20 cycles of five imputations. Uncertainty in assumptions or estimates made during the analysis were addressed in a series of one-way sensitivity analyses. We estimated uncertainty around the incremental cost effectiveness ratios of cost per QALY using the bootstrapping technique. We generated 1000 replications of each incremental cost effectiveness ratio and used them to derive cost effectiveness acceptability curves. A total of 579 participants were randomised across the eight groups. Table 3⇓ shows their resource use relating to back pain. Four hundred and seventeen (72%) patients had no primary care contacts relating to back pain during the course of the study, 98 (17%) had one, and 64 patients (11%) had two or more. Seventy five (13%) patients had at least one outpatient visit; most referrals were to physiotherapy, orthopaedics, and pain management. There were three inpatient stays: two for pain management and one for back surgery. Prescribed drug use was higher in the control than in the intervention groups. One hundred and sixty three (28%) participants received at least one prescription for drugs associated with back pain during the year (such as analgesics, muscle relaxants, non-steroidal anti-inflammatory drugs, and antidepressants). The mean number of items per patient for prescribed drugs was 2.7 (95% confidence interval 2.4 to 3.0). Table 4⇓ shows the mean cost per patient by intervention group. Providing the intervention accounted for 77% of the NHS costs. The cost of other health services was greatest for the patients prescribed normal care plus exercise (£124) and those receiving massage alone (£98). Mean out of pocket expenses were £319 per patient, with £135 (42%) of this relating to expenditure on private therapies. Table 5⇓ shows the incremental mean cost per patient to the NHS compared with the change in the Roland disability score, days free of pain, and QALYs. The incremental cost effectiveness ratios indicate the cost to the NHS of a gain in health as measured by each outcome. Of the three “single” interventions (massage, six lessons in Alexander technique, and exercise), exercise is best value on all three outcomes. Adding an extra therapy provides greater benefit at extra cost in all cases, with six lessons in the Alexander technique plus exercise looking to be best value. Table 6⇓ gives the incremental cost effectiveness ratios for the “factorial” groups. Exercise (with and without other therapies) has the lowest ratio for the disability score and QALYs as it is cheapest and delivers the second highest gain, but it scores poorly on pain-free days. Patients receiving six lessons in the Alexander technique (with and without the exercise intervention) perform well on all outcomes. The figure⇓ shows the cost effectiveness acceptability curves based on individual group QALY. These illustrate the scale of uncertainty around the point estimates of cost per QALY given in table 5⇑ and indicate the optimal choice of intervention for a given threshold price. Exercise has the highest probability of being the most cost effective first choice of therapy. If exercise is the first choice, policy makers would have to be prepared to pay more than £18 000 per QALY gain to be 80% sure that a second intervention is cost effective. If exercise is disregarded as first choice because it performs poorly on pain-free days and, to some extent, on the Roland disability score, six lessons in the Alexander technique becomes the most attractive first option. The addition of exercise provides a worthwhile benefit at a modest cost and is more than 80% likely to be cost effective at values above £5000 per QALY. The sensitivity analysis (table 7⇓) addresses three areas of uncertainty. As the cost of the intervention was the major NHS expense, we looked at the effect of adherence. Although it is unlikely that adherence would ever be complete in practice, this provides a benchmark for assessing generalisability. If all patients had attended all intervention sessions, the overall mean cost per patient would have been 18% higher. The greatest discrepancy is with the two groups assigned to 24 lessons in the Alexander technique, where NHS costs would have been 26% higher. Secondly, we looked at the effect of inpatient stays, which are relatively expensive. Excluding these reduces overall costs by 4% with the greatest reduction (45%) in the group assigned to exercise alone, which contained two of the three patients concerned. Finally, we looked at the effect of imputing data relating to personal costs and QALY gain that were missing from the questionnaire responses. The estimated mean personal costs were 3% lower when we used only the complete cases (n=358) rather than the full (imputed) dataset. This difference varies across the groups, with the largest difference in the group prescribed normal care plus exercise, who had the poorest record for returning the completed questionnaire (46%). The estimates of QALY gain using only the complete cases increases the variation across the groups, with the normal care plus exercise group showing the greatest difference. Care for patients receiving one of the seven combinations of interventions to treat back pain cost the NHS between £100 (for normal care plus exercise) and £607 (for 24 lessons in the Alexander technique plus exercise) over the 12 months after entry to the study. Benefits provided were additional pain-free days (8-20 per patient, by group, over four weeks), an improvement in ability to perform daily activities (reduction in the Roland disability score of 0.45-4.22 per patient, by group), and a gain in QALYs of up to 0.065 per patient, by group (except the group allocated massage alone, who experienced a mean QALY reduction). Incremental cost effectiveness analysis suggests that, for a single therapy, exercise offered best value because of its low cost even though it did not provide the greatest benefit. For the two-stage therapies, exercise combined with six lessons in the Alexander technique performed well on all clinical outcomes and was relatively cost effective. This economic evaluation benefits from having been conducted alongside a rigorous randomised controlled trial. However, we faced two important methodological challenges, both of which indicate the need for further research. The first of these relates to missing data. Data on NHS resource use were collected from general practice records, so information on primary care consultations and prescribed drugs is likely to be of good quality. Some data on outpatient appointments could be missing, and the scale of this is unknown; it is, however, likely to be similar across the intervention groups and so should have a minimal effect on the incremental analysis. The quality of the questionnaire data was limited by the response rates, a factor that affected estimates of personal costs and QALYs, particularly for the participants allocated to normal care plus exercise. We had complete EQ-5D data (from all three time points) for 306 (53%) participants and, as the missing values were unlikely to be randomly distributed, we were unable to rely on complete case analysis for realistic estimates as these could be affected by selection bias. Missing data are a common problem in economic evaluation,19 as a large number of patient-level data are used, and a range of imputation techniques is available. Whichever method is used, the imputed data may still be unrepresentative of the true values, and the level and direction of any bias are unknown. We used an established statistical procedure to impute the missing values, which affected results particularly for patients receiving the exercise intervention. Our point estimates of QALY gain are similar to those found elsewhere in a similar patient group,3 though it is likely that the high level of missing EQ-5D data in our study (38%) will produce added uncertainty (that is, more than indicated by the confidence intervals) around the QALY estimates. This uncertainty reinforces the importance of considering all outcomes when drawing conclusions about the relative cost effectiveness of each intervention. The second methodological challenge relates to the design of the study. As it was a factorial design, we analysed and presented the clinical data in terms of the four factorial (marginal) groups. However, the interpretation of this analysis with respect to the economic evaluation is obscure. We have therefore presented an analysis of the eight individual group results as our main findings, thus preserving transparency and aiding interpretation. We also present results for the factorial groups, for completeness and synergy with the clinical results. The cost of the interventions was a major factor in the total cost to the NHS. In our analysis we used the rate that teachers and therapists had been paid during the trial (£30 per session), which included payment for trial-related administration and inconvenience. Recent information suggests that an appropriate commercial rate in 2008 is in the range of £18 to £45 depending on experience, location, overheads, running expenses, and local competition. These factors limit the generalisability of our results, though, as our payment was at the upper end of this range, our results will be conservative and the conclusions remain valid. We did not include the cost of lost productivity in our comparative analysis as the data were incomplete and there was no evidence of a difference across groups. However, back pain clearly has a considerable cost to society. Maniadakis estimated UK production losses to be in the region of £3440m (1998).1 Our estimate of just under a week lost per annum per patient with prevalent back pain is slightly less than that of Maniadakis. After adjusting for population changes and inflation, our (conservative) estimate would imply annual losses in excess of £3000m. The results of this evaluation are limited by the time horizon of the trial. A longer follow-up would have been ideal but was impractical, and there are no reliable data in the literature to populate a model. Nevertheless, it is reasonable to speculate that benefits of lessons in the Alexander technique could have a more lasting effect than either massage or a prescription for exercise. The teaching method used in the Alexander technique lessons5 equips patients with life skills they are more likely to be able to use beyond the intervention period. This study suggests that at £20 000 per QALY there is more than an 85% chance that a general practitioner’s exercise prescription with a nurse follow-up, or a short series of lessons in the Alexander technique, will be cost effective for patients with chronic or recurrent non-specific back pain. It is important for clinicians and policy makers to consider a range of outcomes when drawing conclusions about the cost effectiveness of the interventions.20 In this study we compared the costs of interventions with two distinct types of outcome. Firstly, we compared cost with estimated QALY gain, based on responses to questions gathered on three occasions about health related quality of life. These questions are broad in nature, and, because we used the “area under the curve” method of analysis, the estimates of QALY gain incorporated the information gathered at interim and end time points. Secondly, we compared cost per patient with clinical outcomes at 12 months, which evaluated patients’ ability to perform daily activities and their days in pain during the previous four weeks. Our associated clinical paper5 showed that an exercise prescription alone had only a moderate effect on disability scores and that massage was unlikely to provide a sustained improvement, whereas lessons in the Alexander technique were effective in the longer term over a range of outcomes. Considering the level of uncertainty around the effectiveness of normal care plus exercise, and taking account of all evidence, we conclude that a series of six lessons in Alexander technique combined with an exercise prescription seems the most effective and cost effective option for the treatment of back pain in primary care. Contributors: Jackie Brown designed the economic evaluation and Alan Montgomery and Tim Peters gave statistical advice. PL and GL had the original idea for the study, and DS and FO had been working on a parallel protocol; the protocol was developed by all the authors. PL and DS were the principal investigators, and FW coordinated the trial on a day-to-day basis. KM, JB, and AB managed the data. The analysis was carried out by SH, with all authors contributing to the interpretation of the results. SH wrote the paper, with comments and contributions from all authors, who all approved the final version. SH is guarantor for the paper. Funding: The study was funded by the Medical Research Council (ISRCTN 26416991 (2000-2005)). All researchers are independent of the funding body. Ethical approval: The Southwest Multicentre Research Ethics Committee (2000 MREC: 01/06/54). Maniadakis N, Gray A. The economic burden of back pain in the UK. Pain2000;84:95-103. Moffett JK, Torgerson D, Bell-Syer S, Jackson D, Llewlyn-Philips H, Farrin A, et al. Randomised controlled trial of exercise for low back pain: clinical outcomes, costs, and preferences. BMJ1999;319:279-83. UK BEAM Trial Team. United Kingdom back pain exercise and manipulation (UK BEAM) randomised trial: cost-effectiveness of physical treatments for back pain in primary care. BMJ2004;329:1381. Ratcliffe J, Thomas KJ, MacPherson H, Brazier J. A randomised controlled trial of acupuncture care for persistent low back pain: cost-effectiveness analysis. BMJ2006;333:626. Little P, Lewith G, Webley F, Evans M, Beattie A, Middleton K, et al. Randomised controlled trial of Alexander technique lessons, exercise, and massage (ATEAM) for chronic and recurrent back pain. BMJ2008;337:a884. Fox Z, Nitsch D, Wang D, Bakhai A. Factorial design. In: Wang D, Bakhai A, eds. Clinical trials: a practical guide to design, analysis, and reporting. London: Remedica, 2006. Beurskens AJ, de Vet HC, Koke AJ. Responsiveness of functional status in low back pain: a comparison of different instruments. Pain1996;65:71-6. Von Korff M, Ormel J, Keefe FJ, Dworkin SF. Grading the severity of chronic pain. Pain1992;50:133-49. EuroQol Group. EuroQol—a new facility for the measurement of health-related quality of life. Health Policy1990;16:199-208. Curtis L, Netten A. Unit costs of health and social care 2005. PSSRU University of Kent, 2005. Department of Health. National tariff 2005-06. www.dh.gov.uk/en/Publicationsandstatistics/Publications/PublicationsPolicyAndGuidance/DH_4091529. British Medical Association, Royal Pharmaceutical Society of Great Britain. British national formulary. London: BMA, RPS, 2005. (No 50.) www.bnf.org/bnf. Automobile Association. Motoring costs: running cost tables. www.theaa.com/motoring_advice/running_costs/index.html. Beale N, Hollinghurst S, Taylor G, Gwynne M, Peart C, Straker-Cook D. The costs of care in general practice: patients compared by the council tax valuation band of their home address. Fam Pract2005;22:317-22. StataCorp. Stata statistical software: Release 9. College Station, TX: StataCorp, 2005. Dolan P, Gudex C, Kind P, Williams A. A social tariff for EuroQol: results from a UK general population survey. Centre for Health Economics, University of York, 1995. Manca A, Hawkins N, Sculpher M. Estimating mean QALYs in trial-based cost-effectiveness analysis: the importance of controlling for baseline utility. Health Econ2005;14:487-96. Brouwer WB, Koopmanschap MA, Rutten FF. Productivity costs measurement through quality of life? A response to the recommendation of the Washington Panel. Health Economics1997;6:253-9. Briggs A, Clark T, Wolstenholme J, Clarke P. Missing … presumed at random: cost-analysis of incomplete data. Health Economics2003;12:377-92. Coast J. Is economic evaluation in touch with society’s health values? BMJ2004;329:1233-6.